Berry loves dogs, especially the teeny tiny ones. She enjoys running after them, but sometimes I get worried, because she likes touching them on the face and tapping the nose. I really have to train her to be careful and to be more gentle. Last weekend, we went to a birthday party in Connecticut, where she met Killy, a Pekingese. 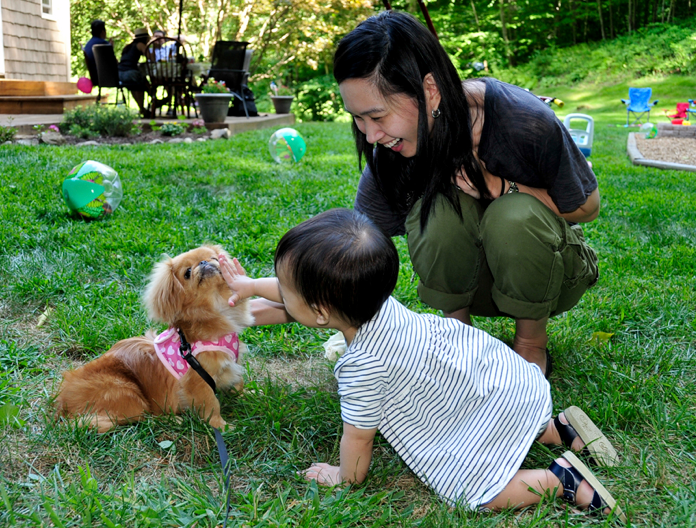 Good thing Killy is a gentle one, I read that Pekingese aren't exactly child friendly. Actually, when Berry first started running after her, she did her best to avoid Berry, hahaha! 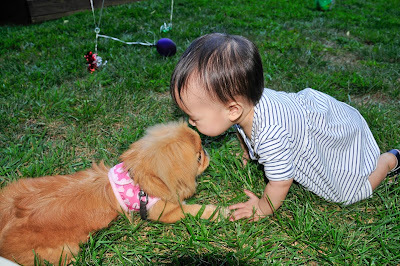 But eventually, they got along, and Berry even tried kissing her on the face! To much success! I guess she realized Berry didn't mean her any harm, so she responded by licking Berry's face a couple of times, to Berry's delight! Now, for the requisite outfit shots! Just keepin' it real. Berry wearing a dress stained by strawberries. Here I am in mommy clothes. Hey, it's all about dressing for comfort! It's no joke running after an active 14 month old. Ever since Berry came into this world, I've come to appreciate and respect nannies more than ever! What a tough job! 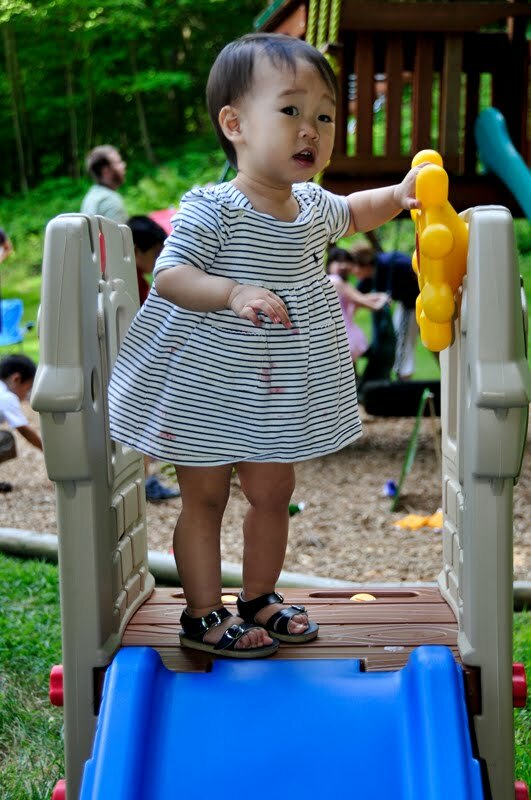 When Berry was still a newborn, I told my friend Paz I couldn't wait for her to be more interactive and start walking so I could play with her, and Paz told me to enjoy every minute of their babyhood because it doesn't get any easier. True enough, these days I wish Berry could sit still even for just a minute! Then again, taking care of Berry is a workout in itself. On the bright side, my arms have never been as toned as they are now, what with all the carrying I've been doing! Speaking of workouts, isn't that all the more reason why I deserve pretty and comfortable shoes! Wahahaha! Where's the connection? Too cute for words. You and Berry. Love the shoes, Tin! Berry is such a happy little girl. i love love berry's photos! i knew beforehand she's a dog lover!!! hi tin! i think i saw you 2/3 days ago, you were waiting at the bus stop in front of your bldg... i think you're on your way to the city, it was mga 6pm... hehehehe anyhoo, max misses berry na! when's the next playdate?!?! summer is almost over... which brings me to one of my fave seasons, fall!! how are you and berry? Heehee! Yes, she loves dogs Trina! Yes Neva! No excuses! Hahaha!